David Blair is an experimental physicist, who has pioneered three separate areas of precision measurement science. He pioneered ‘microwave cavity electro-mechanics’ (which make ultra-sensitive displacement measurements that harness electromagnetic springs and self-cooling), the use of ‘whispering gallery modes in sapphire’ (for the creation of exceptionally low noise clocks and oscillators), and the study of ‘three mode interactions’ (that underpinned the detection of gravitational waves in 2015). 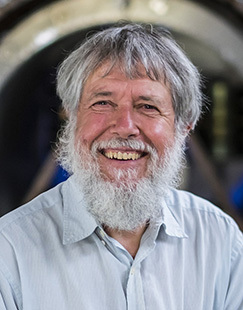 Blair also led the creation of the Australian International Gravitational Research Centre in Western Australia, which contributed to the LIGO Scientific Collaboration and helped enable the detection of gravitational waves.